The Health and Safety Guideline 282 (HSG282) came into effect in early 2017. The main aim for the introduction was to reduce the risk of Legionella outbreaks associated with spas and hot tubs in commercial settings. Section 5 of the guideline focuses on water testing and what needs to be tested: Disinfectant, pH and Total Dissolved Solids (TDS). Levels should be in the following ranges: Chlorine (free): 3 – 5mg/lBromine: 4 – 6mg/lpH: 7.0-7.6TDS: 1500mg/l (or 1000mg/l above the reading of the supply water). 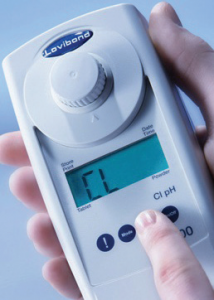 For Chlorine, Bromine and pH, Tintometer recommend a photometer such as the Lovibond® MD 100 3in1 Photometer, supplied in a carrying case complete with tablet reagents for 100 tests of each parameter. TDS is carried out using a pen-type meter such as the SD 80.